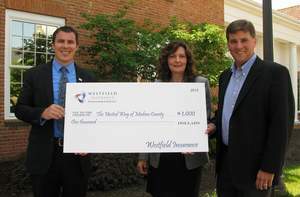 WESTFIELD CENTER, OH--(Marketwired - May 29, 2013) - Westfield Insurance announced today that it will donate $1,000 to United Way to benefit Medina County children. The money is a result of Westfield Insurance and IBM's achievement in the INFORMS Innovative Applications in Analytics competition. The INFORMS honor recognizes innovative application and integration of a range of analytics techniques for the purpose of making a difference in a business organization. It was awarded during the Conference on Business Analytics & Operations Research, held in San Antonio, TX, from April 7-9. "Westfield Insurance believes that supporting education is one of the ways we are protecting our future by preparing our young people to succeed," said Westfield Group analytics leader Elizabeth Riczko. "We are pleased to use this prize money to support and encourage another generation of young mathematicians and analysts." The award recognizes the combined work of Westfield Insurance and IBM for their entry "Insurance Agency Productivity and Prospecting." Their paper addressed how data envelopment analysis, predictive analytics, collaborative filtering and reporting were combined into a single, end-to-end, fact-based decision-making process to successfully manage relationships with Westfield's independent agency distribution, such that it is productive and profitable. In business for more than 165 years, Westfield Insurance provides commercial and personal insurance in 21 active states and surety services to customers in 31 states. Westfield is one of the nation's 50 largest property and casualty insurance groups, represented by a network of over 1,000 independent insurance agencies. Westfield Bank provides banking solutions for businesses and individuals, and Westfield Services provides service and training support for independent insurance agencies. Learn more about Westfield Insurance at www.WestfieldInsurance.com.